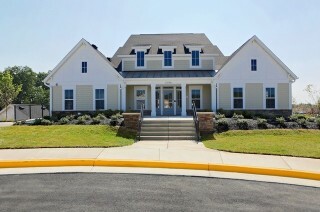 Westridge Clubhouse Completed for Woodlawn Development | Hubert Construction, LLC. In July Hubert Construction delivered the 6,400SF, two-level clubhouse at Westridge, located in the south Dulles Area of Loudoun County. Construction started and progressed through the harsh winter of 2014, slightly delaying the grand opening of the community’s pool facility. In addition to the pool, the building includes a fitness facility with athletic club quality locker rooms, a large community room, with serving kitchen, and an office with conference room for use by the HOA manager and community residents. Hubert provided pre-construction consulting services including management of the design team and building/trade permit acquisition, prior to commencing construction. Hubert Construction is the Washington metro area’s pre-eminent builder of amenity facilities for the home building and residential development industry. Contact Matt Shea 301.721.4393, if Hubert can add value to your next amenity facility project.